Le Château de Beaucastel est depuis longtemps considéré comme l'un des plus grands vins de France et est unanimement réputé à la fois pour son équilibre, son élégance et sa capacité au vieillissement. Beaucastel dispose d'un terroir extraordinaire à la pointe Nord de l'appellation Châteauneuf-du-Pape, très exposée au Mistral. Les treize cépages de l’appellation y sont cultivés biologiquement depuis les années 60. Le Château de Beaucastel dispose d'environ 110 hectares d'un seul tenant au Nord de l'appellation. Le terroir est l'archétype des grands terroirs de Châteauneuf: galets roulés en surface, argiles, sables et calcaire en profondeur. Les vignes sont âgées et la culture biologique pratiquée depuis plus de 50 ans a permis à leur racines de plonger en profondeur. Nez très fin et puissant à la fois, de fruits rouges, cassis, mure, épices, thym et lavande. Attaque de bouche magnifique, ample et souple. La figue, la cerise, la mûre, les fruits compotés... sont soutenus par une belle acidité. Les tannins sont présents mais extrêmement fins. Un grand millésime de Beaucastel. Autour de 15 °C. Si possible, pensez à décanter le vin. Le millésime 2009 est évolué, et offre des notes d’épices et de garrigue. Une touche automnale apporte une complexité supplémentaire. La bouche est ample, les tanins en relief. L’ensemble aromatique est complexe et la bouche garde une belle tenue. A very warm year, this has extremely expressive grenache fruits, raspberry, some honey and a lith juicy core. There’s a late creeping wave of smooth tannins. Darker plum fruits exude power through the finish. Stunning wine from a very ripe vintage. Le millésime 2009 signe une grande année. Belle robe noire profonde, nez évolué, fin et complexe, ce vin explose en bouche avec des arômes d’épices et de réglisse et des tanins souples et soyeux. Marc Perrin presents the Beaucastel 2009 at the Wine Spectator Wine Experience seminar. Un millésime solaire dans ces jeunes années qui doit être attendu, mais qui dès aujourd'hui, de part son équilibre en puissance et fraîcheur, laisse présager une très belle évolution après plusieurs années de garde. Très coloré, quasi noir, ce grand Châteauneuf-du-Pape, puissant, plein, comme on le dit de ces vins auxquels rien ne manque, et aux saveurs de fruits noirs, surpassait par son ampleur, son équilibre, tous les autres vins de la vallée du Rhône goûtés ce jour-là. Majestueux. 30 % Mourvèdre, 30 % Grenache, 10 % Syrah, 10 % Counoise, 5 % Cinsault, etc. Élevage en foudres. Grand seigneur de l'appellation, Beaucastel produit incontestablement l'un des vins les plus achevés de Châteauneuf-du-Pape. Toujours élaboré avec les 13 cépages autorisés par l'appellation, le 2009 adopte une forme particulièrement généreuse et dodue, mais non moins élégante et empreinte d'un fort bel équilibre en bouche, grâce, entre autres, à une pointe d'amertume qui rehausse ses saveurs florales. Déjà fondu et agréable à boire, mais il n'atteindra son apogée que vers 2016. Poursuivant dans le sillon des grands, je ne peux que m'incliner devant ce Château de Beaucastel 2009 en Châteauneuf du Pape, si complet sous toutes ses coutures qu'il me laisse à penser qu'il est peut être le meilleur dégusté à ce jour. Sans blague. Arômes de marc frais derrière une robe violacée profonde, puis paliers successifs de textures où l'éclat et la densité des tanins s'intègrent sur fond de finesse mais aussi de puissance, longuement. Equilibre absolu. Grand vin! Futur classique. Vin gras, chocolaté, puissant et volumineux, avec la fraîcheur et de la densité. Grande énergie. Gilt-edged and always worth picking up on faith, this is a dazzling expression of one of the iconic wines of the world. Cedar, sprigs of herbs, graphite and black currant on the nose, there’s a mélange of concentrated, complex flavours on the palate with cassis, briary berry, spice-laden black plum and juicy, tangy, black Bing cherry to the fore. It’s rich, luscious and full-bodied with deft balance, well-integrated oak, perceptible tannin and a lingering delectable aftertaste. This wine is a blend of 30% Mourvedre, 30% Grenache , 10% Syrah, 10% Counoise, 5% Cinsault and the rest a blend of Vaccarese, Terret Noir, Muscardin, Picpoul, Picardan, Bourboulenc, and Roussanne. There is lovely brambly fruit on the nose tilting towards blue fruit flavors. In the mouth there are lots of up-front softness (not flabby) before a seductive, racy quality (Licorice/Kirsch perhaps) comes out which persists all the way through the long aftertaste. There are dark ripe flavors in the middle with lovely tannins and a stellar aftertaste. I imagine this will drink earlier than the 2010. A beautiful and very good wine. Very approachable right now this is hard to resist drinking but should be amazing once mature. My splurge/collector’s choice from the release. This is world class wine, one that you can easily set aside for at least a decade. Given what “world-class” typically means in buying wine, the price is more than reasonable. Beaucastel is noted for an unusually high proportion of Mourvedre in its Grenache/Syrah blend, which gives it longevity. Right now the wine shows an underlying earthiness, with opulent black fruit and a touch of black olives, mixed Asian spices, and a whiff of pencil lead in the background. One of the more endowed 2009s, this is packed with dark smoldering cocoa, mesquite, tobacco and roasted fig notes, all inlaid with pure cassis and plum preserves fruit flavors. Long and authoritative on the finish, with singed vanilla bean and tar adding length and dimension. This is a very good vintage. The key word is balance, since high alcohol, low acidity and robust tannins can be features... top names have delivered classy, pure fruit. The wines will live well. Bountiful aroma; nuanced, engaging fruit. Drink 2016-2045. 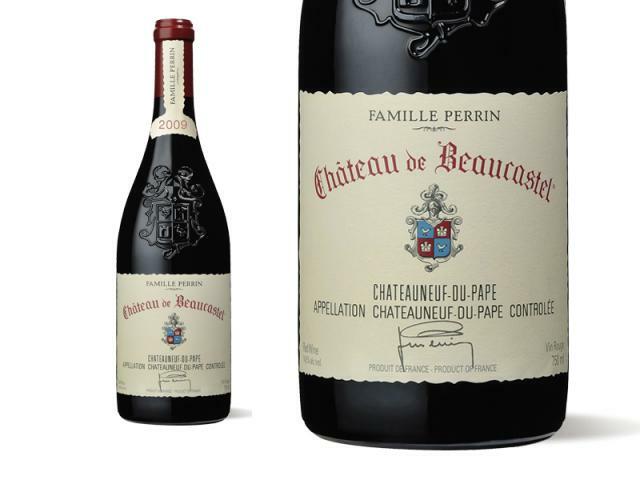 The 2009 Beaucastel Chateauneuf du Pape is reminiscent of their brilliant 1985. It will be one of the rare Beaucastels that is drinkable upon release. Made from this estate’s classic blend, it possesses soft tannins as well as a silky, open-knit seductiveness, a dense plum/purple color and a beautiful perfume of smoky Provencal herbs intermixed with grilled steak juices, garrigue, kirsch and blue as well as black fruits. The wine is full-bodied, unctuously textured, and silky smooth (the latter characteristic being somewhat atypical for a young Beaucastel). If it performs like the 1985, it will drink well young and continue to do so for 25 or more years. Il offre un nez de fruit très mûr (figue, prune) ; on a le côté solaire du millésime à la fois dense, abondant en bouche mais aussi un peu mat. The 2009 Château de Beaucastel Châteauneuf-du-Pape had just been bottled at the time of the tasting but you wouldn‟t know it by tasting it. A blend of 30% Mourvèdre, 30% Grenache, 10% Syrah, 10% Counoise, and 20% assorted varieties, the wine delivers a superb aromatic display of kirsch and black cherry-like fruits to go with a solid dose of underlying meat, truffle, earth, and leather. Full-bodied and gorgeously concentrated through the middle, with fleshy, ripe fruit, good acidity, and an abundance of structure, this will ideally be left alone for 7-8 years and then consumed over the following two decades. Un nez expressif avec des arômes de miel, agrumes confits et sucre roux, le vin est généreusement boisé, avec une richesse raffinée en finale. This is not the bottled final blend but it's very close to it. 13 varieties including 30% Mourvèdre, 30% Grenache and 10% Syrah, 10% Counoise, 5% Cinsault. Held back but there is so much waiting to escape. You can feel all those components coming together (I had just tasted the varieties Grenache, Syrah, Mourvèdre, Counoise and Cinsault as separate - non-commerical - bottlings). The brightness of the Grenache, that dry, firm framework and length from the Mourvèdre and the completeness of the blend. Dry, fresh, long and impressive in its embryonic state. Power and finesse. Great length. Issu d'un assemblage classique de grenache, de mourvèdre, de syrah et de counoise, Château de Beaucastel 2009 se montre profond, moyennement corsé et doux. Beaucastel is one of the top properties in Châteauneuf-du-Pape. Year after year, they produce a multidimensional, age-worthy wine. Although Mourvèdre and Grenache, at about 30% each, comprise the majority of the blend, Beaucastel uses all 13 grape varieties permitted in the appellation, which may explain the phenomenal complexity of their wines, especially the 2009. Their 2009 combines exotic earthy nuances with ripe red and black fruit flavors without being overdone, alcoholic or heavy. It’s remarkable for its power coupled with refinement and freshness. New flavors emerge with each sip and after 30 minutes it’s as though you are tasting an entirely different wine. Though seductive and engaging now, my experience with Beaucastel tells me it will evolve beautifully over the next two decades. Lovers of châteauneuf-du-Pape in general or Beaucastel in particular will want this one in their cellars.